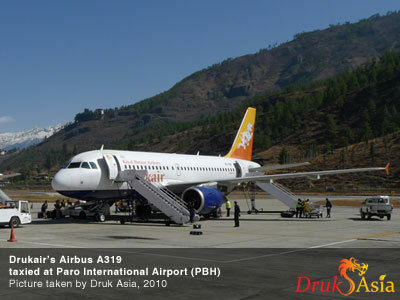 As of June 2011, Drukair is the only airline that serves Paro. So all visitors to Bhutan are initiated into the kingdom in her care. The flight into Paro is one of the most spectacular in the world. Whether flying along the Himalayan range from Kathmandu or over the foothills from Calcutta or Dhaka, each flight is a mesmerising aeronautical feat and offers an exciting descent into the Kingdom of Bhutan. 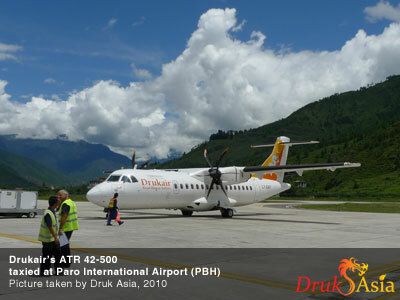 The ATR 42-500 begins operation with Drukair in June 2011. It will fly to the nearby cities of Kolkata, Kathmandu, Guwahati, Gaya and Bagdogra. It is a 48 economy seater but can be also converted into 8 VIP seat and 22 economy seat, available for charter.